Paris Calling: No more fear on the Rue de Tangiers? 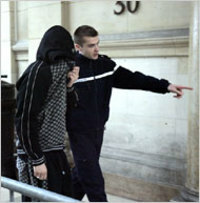 When I first arrived back to France in January 2005, police had just arrested a "terror cell" of youngsters dead-set on doing jihad in Iraq. The men were talked into volunteering by a young preacher, Farid Benyettou, who worked out of the mosque on Rue de Tanger in the 19th Arrondissement. This, the political set claimed at the time, was the beginning of a vicious wave that would connect mayem in the Sunni Triangle to the streets of bourgeois Europe. Not long after, I found myself passing metro Stalingrad on a bike ride and noticed the street and for about a kilometer, until I passed Barbes onto the safe shores of Montmartre, I was in fear, pedaling at a brisk pace, unsettled by the North African men who, who knows, may have wanted to get their hands on a crusading yank. Oh fear! Three years of post 9/11 New York had done a number on even wise ol' me. But time passes. For now, and isn't this how life works, I live a block away from Rue de Tanger and its mosque; thinking of buying a place in the neighborhood too. And perhaps I will: as the trial wraps up for these jihadists manqués (though two of the seven on trial did make it to Iraq), The New York Times says my fear of jihad that afternoon may have been just a tad overblown.